When last we left our heroes, the sixth season of Scrubs had been released on DVD and the seventh and final season was set to begin airing. But as several of the characters have already learned, a lot can happen in 9 months. Season seven was supposed to have 18 episodes, culminating in the series finale. But in the course of the season, tremors in Hollywood shook Sacred Heart hospital. 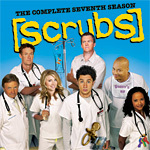 Shortened by the writers’ strike, the seventh season of Scrubs only has 11 episodes. The DVD set only has two discs instead of the usual three. Season seven picks up right where season six left off, with J.D. and Elliot leaning in toward a kiss that would bring their on-again, off-again relationship on again... which would be a big mistake since at that moment, J.D. is in a relationship with his baby’s mama and Elliot is engaged to be married. That situation quickly gets lost in the whirlwind of new developments for the season, the biggest of which, one episode later, is the birth of J.D.’s son. Old characters return, new characters are introduced, and some of the background faces come to the fore for a closeup. The big episode of the season is called My Princess, about two-thirds of which is set in a fairy tale land with horses and costumes and medieval outdoor settings. Fairyland aside, all in all, the DVD release of Scrubs season seven is another round the same old show that you’re comfortable and familiar with. Two other aftershocks shook Scrubs in the intervening months. First, ABC acquired the show from NBC because, second, they wanted to keep the show alive for at least one more season. Rumor has it that most of the stars will return for season eight. Many of them have promised to leave the show after that, although whether ABC tries to keep the show alive after that by some sort of invasive surgery remains to be decided. There are only 2 DVDs this time, but there is still room for the usual extra features. The grandest of them is the documentary on the making of My Princess, the fantasy episode that pays homage to The Princess Bride. The documentary shows the work that went into the costumes and makeup for most of the cast, along with some bits about the writing and directing of the episode. The other extra features are pretty much the usual skimpy suspects. There’s a short interview with Ken Jenkins (Bob Kelso). There are bloopers, deleted scenes, and alternate lines, none of which are particularly revealing, but might be worth a quick chuckle if you need just a little more Scrubs. These are the same types of features you can find on the other seasons’ DVD releases. When you have a formula that works, you might as well stick with it. The picture and sound quality are good, as always. One might wonder if the show were launched today whether it would be filmed in a widescreen format. The show is presented in its standard, square TV aspect ratio. Leave the disc in your player and watch 1 or 2 episodes at a time. It’s a non-challenging way to unwind after a long day at work.